One of the oldest English dessert pears, it was discovered in the late 18th century and quickly became popular. In England and Europe it is known as Williams or sometimes Williams Bon Chretien, after the nurseryman who first propagated it, whereas in North America it is usually known as Bartlett. If you buy tinned pears, they are very likely to be this variety. Don't let this put you off though - Williams is a good early-season pear variety for the gardener too, with a very good flavour and fairly easy to grow. Please fill in the details below and we will let you know when Williams pear trees are back in stock. A red-coloured sport of the popular Williams pear, with a similar good flavour. Williams is in flowering group 3. Williams is partially self-fertile, but fruiting will be improved if there is a compatible tree of a different variety nearby. Since it flowers in the middle of the blossom season it can be pollinated by most other pear trees. Make sure you pick the crop just before it becomes ripe - which will be late August or early September in the UK. Williams is generally easy to grow but can be susceptible to scab in wetter areas. Cropping is usually reliable even in less than ideal conditions, and Williams is a good choice for pear enthusiasts in the north of the UK. UK, 18th century. This pear is known both as Williams and Bartlett. 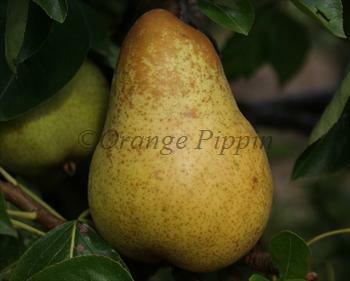 The fascinating origins of this pear were recorded by the Victorian fruit enthusiast Robert Hogg. He credited its discovery to either a Mr Wheeler or a Mr Stair, both schoolmasters in the town of Aldermaston, Berkshire, England some time before 1770. It was subsequently propagated by a nurseryman, Mr Williams of Turnham Green - who named it the Williams pear (perhaps to cut through the confusion surrounding its origins). In 1799 trees were sent to the United States - a good demonstration of the close ties that already existed between England and the newly-independent United States. The imported Williams pear trees were planted in an orchard near Boston and came to the attention of a local nurseryman, Mr Bartlett, who played an important role in popularising the variety in the USA. It appears the original variety name was uncertain by this stage, so Bartlett (nicely repeating the decision of his English counterpart) decided to give it his own name. In this way the new variety became known as Bartlett in North America and Williams in the UK and Europe. Hogg suggests that the Bartlett pear was well suited to the climate of its new home, and was soon regarded as "the finest pear of its season". It became a major commercial variety in the USA.